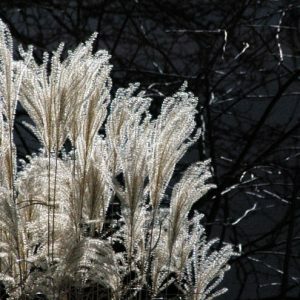 Fall is the time of the year when birds become very active in the garden. I love birds in my yard, and we here at TGG have feeders and bird baths that we keep active all year round to attract the little guys. 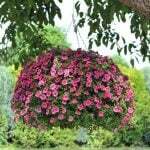 Oh, and they are great garden decor as well! 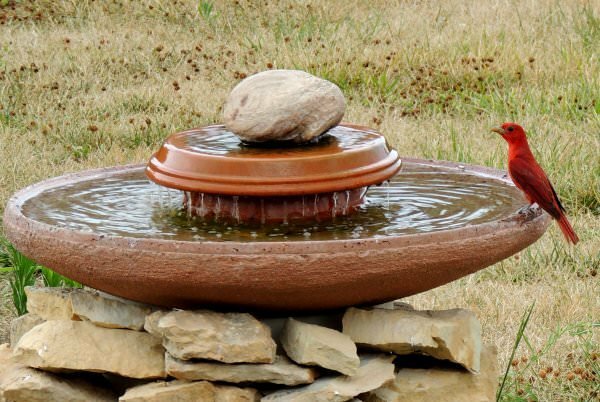 Clean your bird bath every few days, even in the winter. 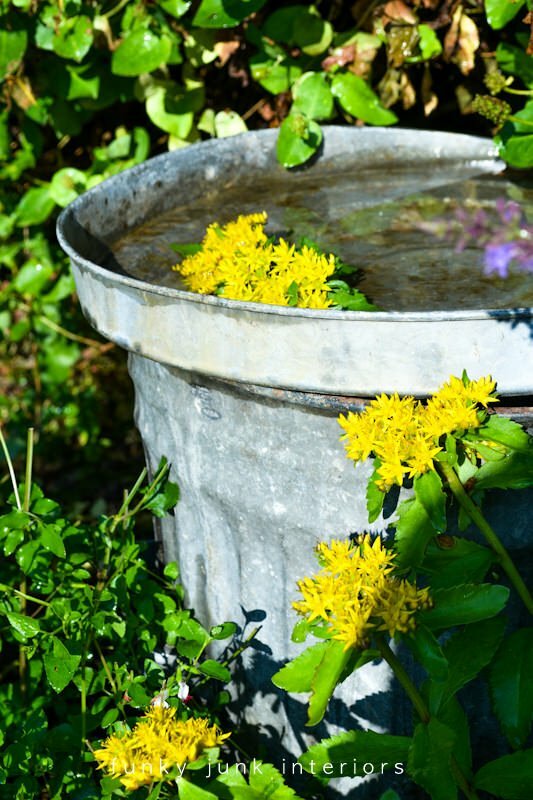 Place your bird bath where predators such as cats and dogs can’t hide in waiting. 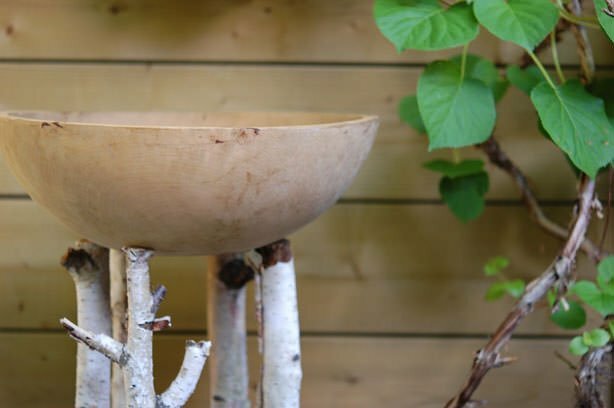 So try these creative DIY bird bath ideas and keep your feathered friends coming back all year long! One of our favorites from our friends over at ‘The Art Of Doing Stuff’. This project is simple and uses just a candle plate from Ikea and 3 dowels or old broom handles. Check out the tutorial here. We were also thinking that doing this project with copper pipe instead of the dowels would be cool… especially as the verdigris takes over with age! 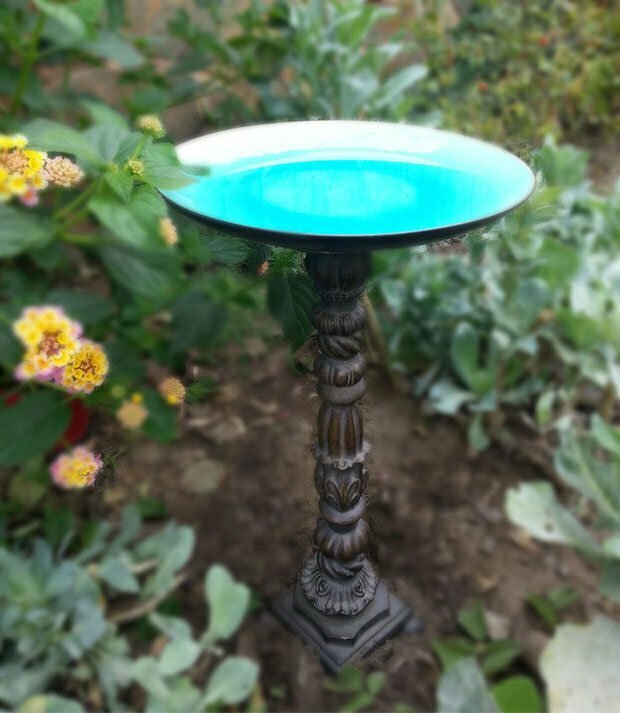 This DIY bird bath is simply an old candlestick, a pretty plate and some Gorilla Glue! 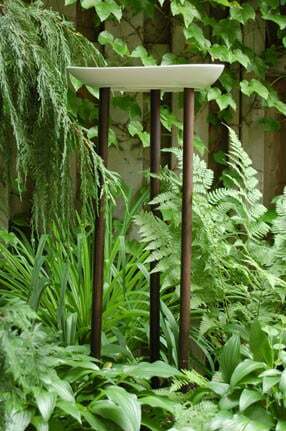 Great re-purposed bird bath! If the candlestick is hollow (or you can drill out the bottom) insert a stake into the ground, then slip the candlestick over the stake to give it more stability. If it’s a heavy metal candlestick, you have it made! Another one from ‘The Art Of Doing Stuff’. This one can be done for free! Check out the tutorial here. 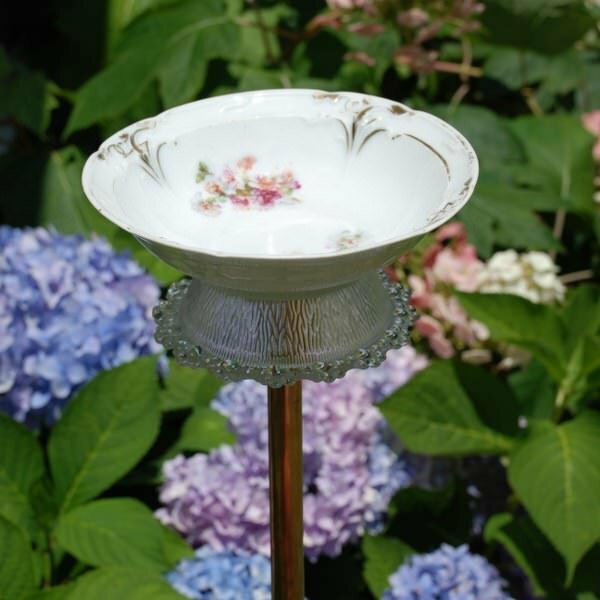 This would be a pretty choice for a cottage style or Victorian flavor in a garden… and of course, you can choose the glassware to determine the type of style… A quick trip to the thrift store (or your cabinets!) and more Gorilla Glue or construction adhesive. Make sure you stack your “column” before gluing to make sure the combination of glassware you choose is stable. Make changes accordingly. Take a cell phone pic so you can remember how to reassemble with the glue! 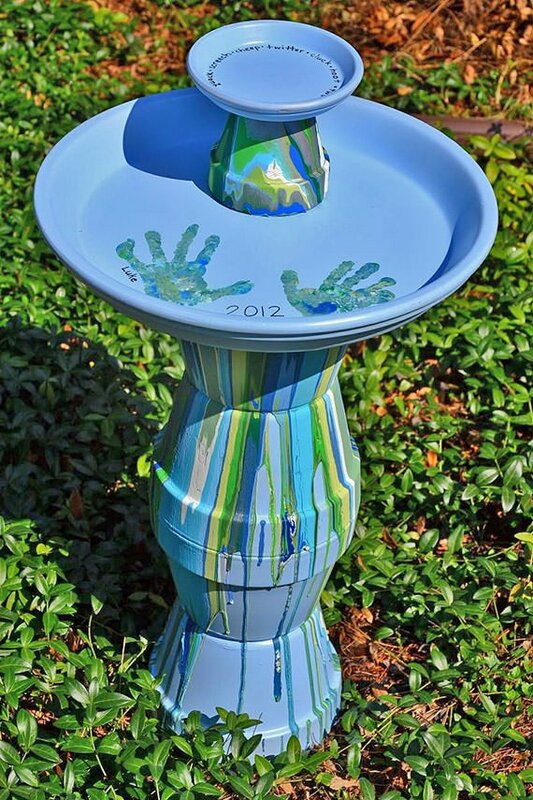 Love this colorful diy bird bath from ‘In Lieu Of Preschool’. They did such a great job and even got the kids involved. See the complete tutorial here. 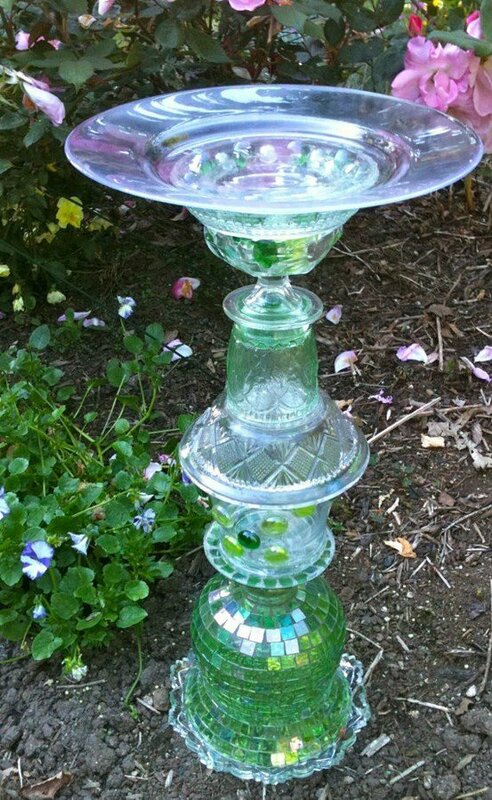 Bird Bath Fountain – Can do this without the fountain of course! Check out the tutorial at ‘Dailykos.com’. Another tutorial here from ‘My So Called Crafty Life’. Update: We came across this one from ‘Funky Junk Interiors‘. It’s so cute and simple that we had to add it. Have an old metal garbage can lid (with no holes)? Flip it over, and add water. Your done! Love these! Going to venture out of my comfort zone and give one a try! I have a crystal candle Albra and one of the crystal sclopps broke and I have tried to glue with every hing and even gorilla glue and can’t get it to hold any suggestions or is their a special way to make glue hold? It was very expensive and I don’t want to get rid of it. Please don’t make them so deep that the birds can’t get out!! Some of these pictured here are death traps for birds. I’ve seen it happen. And birds don’t like to hop into water, they like to walk into water, so make sure you have sloping sides. I love all of these ideas. 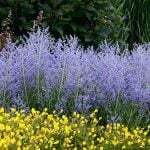 As a beekeeper, I wanted to add that honeybees also need water and will drink right along with the birds. Thanks for the tip Julia! Bees are our buds! I have noticed bees drinking from my bird baths. I get a real buzz out of it?? Attracting wildlife to your garden is a rewarding way to learn about animals. 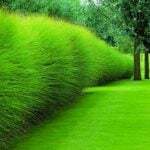 By tailoring your garden to the needs of animals, you help to improve your local environment and foster wildlife diversity. 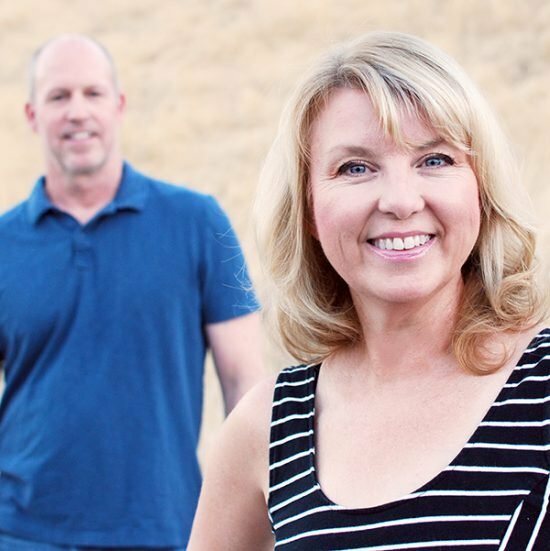 What an awesome site for Wildlife Garden .With a little planning, your yard can become a prime spot for birds to fuel up and take refuge during those long, cold months. 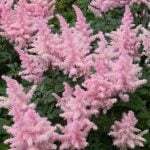 The key is to select a mix of plantings, shrubs and trees that offer birds the protection and food they need to survive.